normal language development, speech and language disorders in early childhood, and multi-cultural issues in assessment and treatment of speech/language disorders. Dr. Brady received her PhD in Communication Science and Disorders at the University of Missouri in 2009 and joined the Speech Pathology/Audiology faculty at SIUE in 2011. Dr. Brady is a certified speech-language pathologist and has worked in a variety of clinical settings. 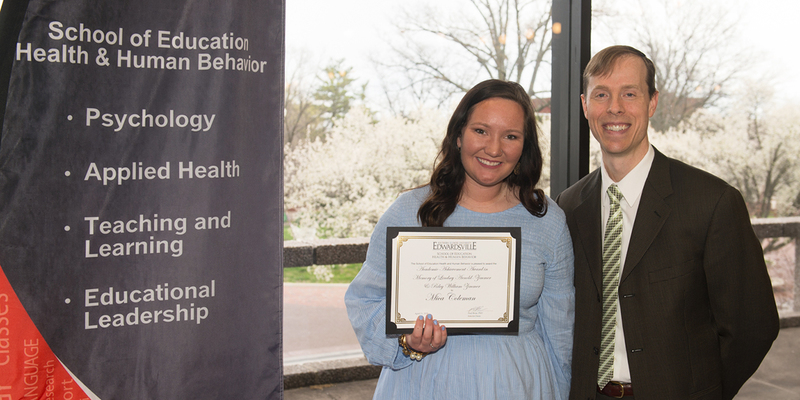 She teaches undergraduate and graduate coursework in normal language development and child speech and language disorders and also supervises student clinicians in the SIUE Speech-Language-Hearing Clinic. Dr. Brady’s research interests include (1) early language acquisition in typically-developing children (birth to three) and children with language disorders/delays, specifically the role of input (e.g, type and amount of language used by care providers) and cognitive factors (e.g., attention and working memory); (2) the assessment and treatment of bilingual children and children with limited English proficiency, and (3) efficacy of early speech and language intervention. Her current research projects (many conducted with student researchers) include studies examining differences in parent-child interaction during reading of traditional picture books and interactive eBooks (typically-developing children and children with autism); typically-developing preschoolers’ use of semantic cues in word learning; the nature of early intervention services provided to a non-English-speaking family through an interpreter; and the effectiveness of vowel training in an accent modification program serving a non-native speaker of English. Future research plans include further examination of the relationship between technology (e.g., eBooks and tablets) and communication development in typical children and children with autism, efficacy of speech/language therapy in early intervention settings, and assessment and treatment of child speech and language development in immigrant and refugee populations. Brady, K.W., & Goodman, J.C. (2014). The type, but not the amount, of information available influences toddlers’ fast mapping and retention of new words. American Journal of Speech-Language Pathology, 23, 1-14. doi: 10.1044/2013_AJSLP-13-0013. Brady, K.W., Pezold, M., & Early, K. (2013, November). Pragmatic Language Use of Mothers & Children During Shared Reading of Ebooks & Traditional Books. Poster presented at the annual convention of the American Speech-Language-Hearing Association, Chicago, IL. Brady, K.W., King, A., Pezold, M. & Voreis, G. (2013, November). Increasing On-Task Behavior: Investigating the Potential Effectiveness of MeMoves™. Poster presented at the annual convention of the American Speech-Language-Hearing Association, Chicago, IL. Forbis, A., Goodman, J.C., & Brady, K.W. (2013, November). Mothers' Conversational & Pragmatic Structure When Reading to Young Children With Autism & Typically Developing Peers. Poster presented at the annual convention of the American Speech-Language-Hearing Association, Chicago, IL. Brady, K.W., Henderson, J.S., Pezold, M., & Smith, M. (2012, November). Language Use During Shared Reading of Ebooks and Traditional Story Books. Poster presented at the annual convention of the American Speech-Language-Hearing Association, Atlanta, GA.
Crowe, T., Goodman, J.C., Brady, K.W. (2012, November). Pointing & Verbal Behaviors of Mothers of Toddlers With Autism. Poster presented at the annual convention of the American Speech-Language-Hearing Association, Atlanta, GA.
Grelle, L., Goodman, J.C., & Brady, K.W. (2012, November). Syntactic & Conversational Structure Directed to Young Children With Autism. Poster presented at the annual convention of the American Speech-Language-Hearing Association, Atlanta, GA.